It takes 50% more time to make a hybrid powertrain compared with a conventional engine while EVs take 40% less time. When a staunch EV skeptic such as Fiat Chrysler Automobiles CEO Sergio Marchionne becomes a believer in electrification it leaves little doubt that battery-powered cars will play a significant role in the industry's future sooner rather than later. "Electrification is here," Marchionne told analysts in late July. He said the switch to 48-volt mild hybrids, full hybrids, plug-in hybrids, and battery-powered models has been sped up by the rising anti-diesel sentiment and the fact that, especially in Europe, "some type of electrification of gasoline engines is inevitable." Now the big question is: What effect will the switch to electrified models have on workers in Europe? 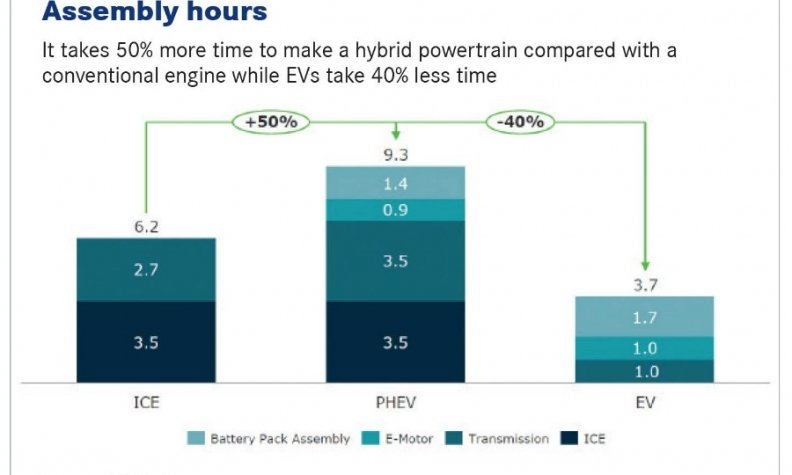 This is especially relevant when comparing the time it takes to make a battery-powered car and a vehicle with a traditional powertrain (see chart above). Full-electric cars are faster and easier to assemble than a diesel or gasoline model because there are fewer parts to contend with. Volkswagen Group's powerful works council head, Bernd Osterloh, told German daily Sueddeutsche Zeitung that the transition to electromobility will mean "more people will leave the company than the new ones the group will hire." A recent study by AlixPartners, however, suggests that Osterloh's fears might be exaggerated, particularly in the short to medium term. The management consultancy, which predicts Europe's diesel share will drop to 9 percent in 2030 from about half of all car sales now, sees the move toward more electrified powertrains adding up to 25,000 jobs in powertrain production in the next 13 years. AlixPartners' employment forecast is based on the assumption that the number of cars and light commercial vehicles sold in Europe (including Russia) will rise to 24 million in 2030 from 18.9 million in 2015. The firm predicts that full-electric cars will account for all of the 5.1-million-unit increase. AlixPartners also forecasts that the number of cars sold with a traditional powertrain in Europe will grow to 20.8 million in 2020 from 18.9 million in 2015, but that number will decline to 20.5 million in 2025 and 18.9 million in 2030. The volume for cars with hybrid powertrains (including plug-in hybrids) is expected to rise to 2 million in 2020, to 6.3 million in 2025 and to 11 million in 2030, up from a fraction of the market now. According to the study, the production of a hybrid vehicle powertrain (engine plus transmission) requires an average of 9.3 hours, which is 50 percent more time than the 6.2 hours needed to assemble a non-hybridized powertrain. Meanwhile, a full-electric powertrain (including the battery pack) requires 3.7 hours, which is 40 percent less than a conventional powertrain. "We have calculated these ratios with a bottom-up process, adding the man hours necessary to produce the various parts of an engine," said Giacomo Mori, who is managing director at AlixPartners' Italian branch. Excluding engine component production, European powertrain assembly plants currently employ 112,000 people, AlixPartners estimates. It sees that number increasing by 11,000 jobs between 2015 and 2030 largely because of the added complexity that comes with producing hybrid powertrains. Moreover, AlixPartners expects another 14,000 powertrain jobs to be created in Europe to meet demand for the expected 5 million full-electric cars that will be made in Europe in 2030. Altogether, that's 25,000 additional powertrain jobs in Europe. "In the next 10 years, we won't see big reductions in capacity," said Mori, who expect plants to be converted to meet Europe's changing powertrain demands. He said that even the most pessimistic models show no significant reduction in powertrain jobs in Europe in 2025. That gives automakers and suppliers eight years to get ready for massive changes because just as Marchionne said, "electrification is here," and it is not going away.